This is a picture of the latest version of our CNC Rifling machine it was specifically designed for precision rifling Air Rifle barrels of all calibres. This machine is the result of many years of development and various other versions have been made but we finally settled on this system in which the grooves are cut or cold formed using our own exclusive techniques. It utilises modern thinking and materials to produce a structure that has the rigidity to do the work without unnecessary weight. The stand can be removed and it will work on a bench if required. We set out to make something to primarily produce our super smooth Whirlwind barrel. Whilst specifically designed for Air Rifles, it can of course produce barrels for other types of rifle if required but our level of expertise does not cover that aspect. However we would work with anyone (company) who wanted to do so by supplying the additional machining information that they would require to use it. This could be the first commercially available fully adjustable and portable rifling machine that is not overly expensive and is capable of economically producing 1 off or small batches of barrels up to and including production quantities of over 150 barrels per shift if required. Whilst this one was produced in our workshop, we have a supplier who will produce them on a reasonably quick delivery if there is sufficient requirement for us to start supplying them. The tooling cost for changing from one calibre to another can be as low as £100 which is far less than the costs involved with hammer forged or button rifling systems. The starting point for rifling any barrel with this machine is a blank with an accurately produced bore and this can be either a precision tube or a gun drilled blank. For our cold forming process we prefer the gun drilled finish to the one usually associated with precision extruded tube. We would envisage that any company who bought one and used it as per instructions could produce high quality barrels for around £20 using gun drilled blanks and probably half of that if they had suficient numbers to warant having their own precision tube produced. We were pleasently surprised to discover how easy it was to find suitable gun drilling companies to supply the required quality of blank needed. We could of course advise on the types of material that we found to give the best results. Please note that in most cases gun drilled barrels require the outside diameter to be machined true with the bore for accurate fitting to the rifle. However there are ways and means of avoiding this with a little thought. 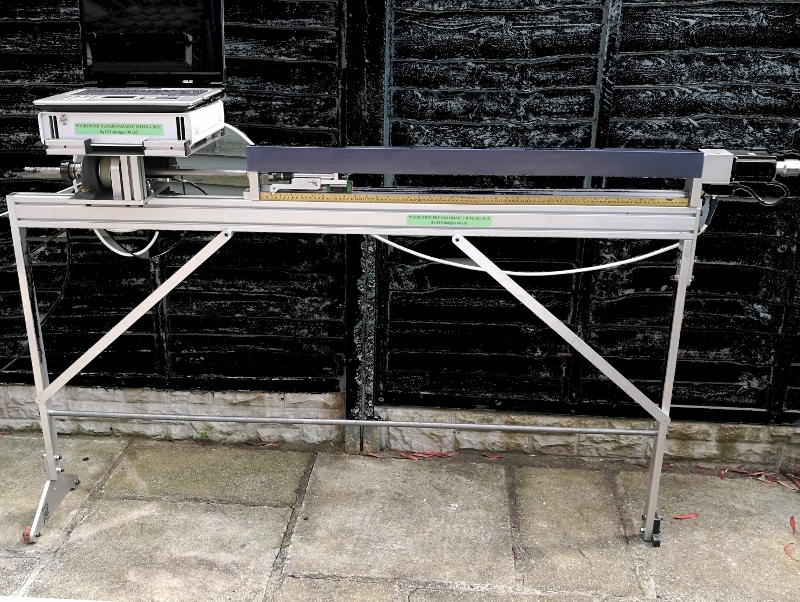 This machine is the ideal solution for producing barrels of all calibres from standard ones such as 4.5 mm (0.177) up to those required for big bore rifles of say 19mm (0.75). As shown here this machine can be programmed to rifle barrels from under 150 mm (6") up to a maximum of 760 mm (30"). A version of it can be made for longer ones if required. The pitch and number of grooves are programmable but in some cases it must also coincide with the correct tool being used. It is also theoretically capable of producing progressive rifling if that is ever required. This machine uses a version of the ever popular Mach3 G code CNC system and programming is carried out via a lap top computer as shown. We are now in the process of producing a variety of barrels to ascertain which ones work best with each type of rifle.